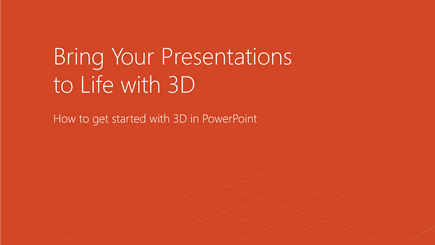 Whether you're creating a presentation in PowerPoint or building a catalog in Excel, 3D makes your work stand out. It's built-in to the Office apps you love, and with Paint 3D in Windows 10, you can easily edit or even create 3D models. 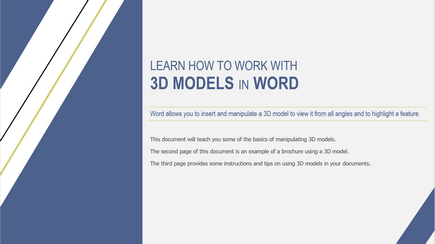 Select Insert > 3D Models. Search for what you want and select Insert. Use Paint 3D to add a logo or texture. With your 3D model open, select Stickers. Choose from existing options or use your own. Move and resize the graphic how you want. 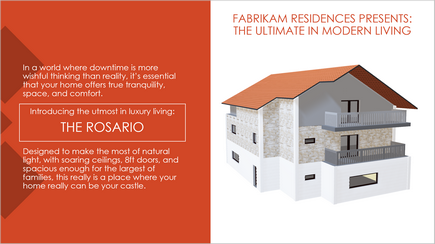 Use this professionally-designed PowerPoint template to render a custom 3D house. Take your PowerPoint presentations to new heights with this training template.